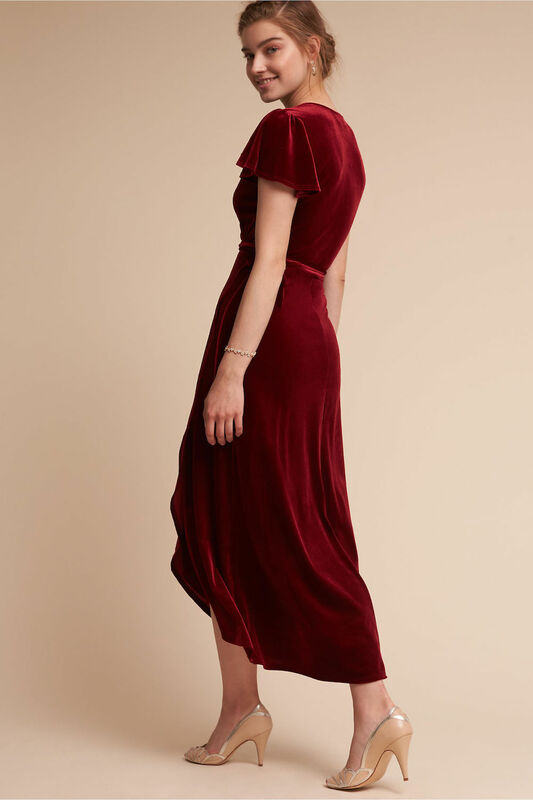 There’s truly nothing trendier than fall fashion, so leave it to BHLDN to break out the lustrous velvet, rich hues and moody prints! BHLDN has the perfect pieces to get us in the mood for any autumn celebration, including fabulous fall wedding guest dresses and simply stunning special occasion dresses. With poise and the utmost elegance, these gowns allow the modern girl to shine while baring a little skin in the cooler weather. We’re talking off-the-shoulder dresses like the Edison Velvet Dress, feminine V-necks, sultry slits and flirty silhouettes. Plus, the gorgeous and soft fabrics shown below offer a classic, flattering fit to stay comfortable while looking your absolute best this wedding season. Get excited for fierce and beautiful patterns, dreamy jewel tones and intricate embroidery, such as the Hope floral dress, that make these wardrobe must-haves so stylish. Whether you’re browsing over wedding guest dresses that’ll give you a bold, polished look, or in need of a lavish gown for another special occasion, you’ll surely fall for these elegant BHLDN dresses!